When the financial crisis happened in 2008, I never imagined what an impact it would have on my career and how that would affect my life. I was made redundant from my job as a national newsreader and reporter on Channel Five News in 2009. I decided to turn freelance and began juggling work with SKY News; SKY Sports News; BBC News radio and television and More4 News, simultaneously. The first nine months were fantastically busy and for a workaholic like me, a real buzz. Day shifts; night shifts; weekends; overnights….I took whatever was offered. Why didn’t I think about going freelance before? But then the recession began to hit the television industry and by September 2009, I started to see the shifts slowly but surely dry up. The drought annoyingly continues and the shifts are still ad hoc. No amount of networking, meetings with managers or independent production companies has brought in a plethora of jobs. Budgets have been tightened and if companies can get staff to multi-task or work an extra shift for a day in lieu, it’s cheaper than hiring someone like me. Over the last year and a half, I’ve wrestled with frustration, unhappiness, angst and have driven my nearest and dearest around the twist – especially the Northerner who’s had to support the both of us and my best mate (Mamma Afrika – more on her another time). But I have to keep reminding myself that without the slow down in pace, I would not have been forced to look at my job and think about developing my skills in another area – primatology. 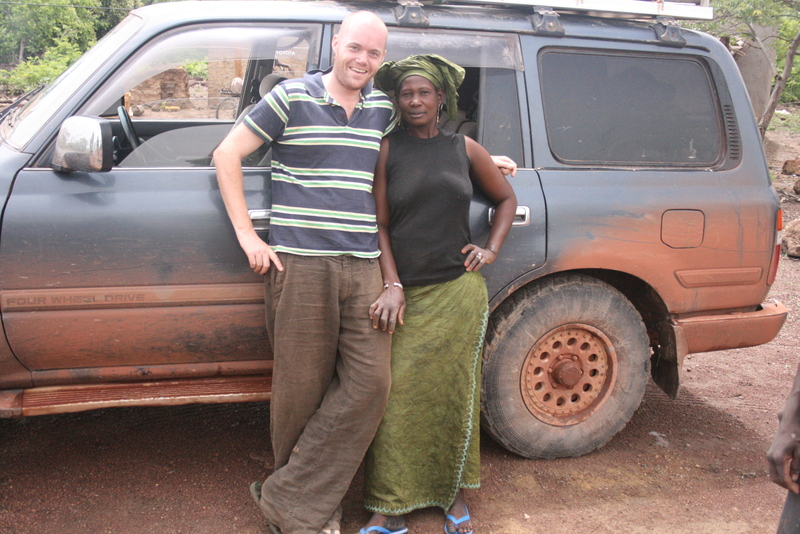 In July 2010, I scraped money together to go on a shoestring budget to Uganda to make three short films; I started this potential Pulitzer Prize winning blog (I know, who am I kidding?!) and I’ve been provisionally offered a place on the Primatology Masters course this September at Roehampton University. I’m also blessed to have incredible support from family and friends who I know will help me out of a hole emotionally or financially if things go really pear-shaped. What’s my point? Earlier this week I was given a reality check by an incredible young man, who put my life and trivia into perspective. Not only was I humbled by our conversation but truly inspired by his drive and determination to work within conservation and I want to share this all with you. His name is Niall (pronounced Neil) Strawson. In 2008 Niall completed a Masters in Biodiversity and Conservation at Leeds University. During the course he went to Mali in West Africa to carry out research. Like myself, Africa left a positive impression on him and he wanted to return to spend more time there. He applied and was offered a research place in Congo, Central Africa, to look at nest density in bonobos (Pan paniscus) also known as pygmy chimpanzees, in February 2009. But a month before his trip he had a accident that dramatically changed his life. While sledging on holiday with a friend in Nevada, California; he came down a hill, hit a bump and went into a stationary car. Niall broke his back in three places, suffered 18 broken ribs and punctured both his lungs. 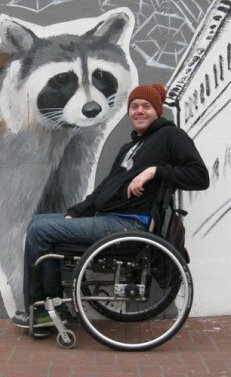 This accident left him in intensive care for three weeks and then a spinal injury hospital for 10 months. He never made it to Congo. During this period he was heavily sedated, but he says he clearly remembers when he heard doctors tell his parents it was highly probably that he would never walk again. He said: “It was like a mental free fall. I wasn’t able to speak because of the drugs. You can deal with the physical aspect of it, but nothing prepares you for the emotional journey you go through. After three months, Niall miraculously started to get some sensation back in his legs. But doctors predicted that he only had a 5 per cent chance of walking. Today he’s permanently in a wheelchair. He has what’s called, an incomplete spinal injury. He can walk using a frame, although he tells me it’s “slow and arduous”. Both his legs have knee braces attached to them. The half boots stretch the muscles in his legs to improve strength and stability and he has Botox injections to relax his leg muscles. Niall says his recovery has slowed over the last two years, but it hasn’t stopped him from pursuing his goal. He’s currently a visiting researcher at Oxford University in the Environmental Change Institute. He’s been analysing other people’s data on whether the shape of the landscape in Gabon, West Africa, influences hunting choices (specifically Bush meat). This summer he plans to go there himself. It’ll be the first time he’s gone to back to Africa since his accident. Africa is not a continent that tarmacs every road. It’s difficult to get around even for the most physically fit and able-bodied person. I was blown away by Niall’s determination to get back out into the field. He told me: “I want to do something that’s going to better me. My motivation is to get published, it’s all down to attitude. I would try anything once, life is too short. Niall says he’s had huge support from family and friends. Yes there were months where he felt vulnerable and empty, but he says looking back over the last couple of years there have been some fun times too – humour he stresses is very important. I wish him all the success on his journey to Africa as well the years to come. He is incredibly brave and I’m sure he’ll be an asset to the world of conservation. He’s also another source of inspiration for me to draw on when I need to put my life into perspective. What an amazing story! Thank you for sharing these; it really reinforces how grateful I should be and am to be able to do things like research with comparatively minimal discomfort. I know, what a tale, huh?! It really does hit home how lucky we are and how we forget to be grateful for the simple things in life. That story is heart moving and quite inspiring to other conservationists. I am quite sorry for Neil for the traumatic challenges he has endured. I am sure he will achieve his goals. How a person copes with disappointment helps to define his or her personality. At first I just wanted to let you know that most people at sky was shocked that the most charming presenter and such lovely person like you has left sky. I hope one day sky will realise what terrible mistake they have done. You had a passion for that job, It was always a pleasure to watch you as a newsreader, or journalist. Some people were watching news just to see you, others were watching because you speak very clearly unlike other presenters with strong accents. I quit my job at sky in 2010 because of lack of progress at my career and I am very happy , at least I can control my life and my career now. It is clear that with your experience in journalist and media industry, and with your passion you can succeed again, there is so many ways to go, life is a bog adventure, there is plenty of opportunities for passionate hardworking people like you. Have you ever thought about your own online news portal? Considering latest news from Japan it is safe , cost effective and realatively easy and fast way to search for information and next gather all news on “Asha’s online news portal” – your website. I know you will be a big star again, you have all it takes to succeed again. I wish you all the best Asha. Thanks for the message. I hope things are going well for you post SKY. The blog has been hugely liberating and it’s a joy to be able to write about what I want. I’ll always be a journalist, whether it’s broadcast or just print, I ask far too many questions for my own good. I’m learning not to over analyse things when they don’t turn out as I had hoped. As a friend recently told me: “How a person copes with disappointment, defines who they are.” Please do sign up to the blog and I hope you enjoy the blogposts.